Italy and Menton Tour Includes: Our Italy and Menton tour includes private transportation and English speaking tour guide, taxes, tolls and parking. Lunch not included. 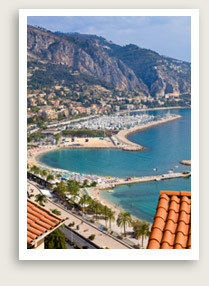 Departure points: Nice, Monaco, Antibes or Cannes. Other departure points available. Inquire. A fantastic day excursion from France or Monaco is Italy, practically next door, and the beautiful coast and towns of the French Riviera. This private guided tour offers a taste of real Italy and its wonderful open-air markets, famous for leather goods, gold accessories and chic fashions. Depending on the day (see market days above), you may visit San Remo or Ventimiglia, both of which enjoy an attractive seafront locale. After a drive along the charming Italian Riviera, you may have lunch by the beach of Ventimiglia at a restaurant called Giuseppe’s, where you will taste the best fresh pasta of the region accompanied with seafood or vegetables. Return via the seacoast road, driving through Menton, a charming town straddling the Italian border known as the “pearl of France.” Walk the picturesque old town before continuing on the spectacular High Corniche road. You will stop for a panoramic view over Monaco from La Turbie before heading back.